Winchester Cathedral was built over 900 years ago. Yet, the grassy land in front of it – the Outer Close – is lacking in gravestones. It wasn’t always like this – the cathedral cleared the area in the 19th century. One of the few headstones that survived this cull was that of Thomas Thetcher, also known as the “Hampshire Grenadier”. Thetcher died in 1764, aged 26. The cause of his early demise? “A violent fever, contracted by drinking small beer when hot”, according to the inscription on his grave. 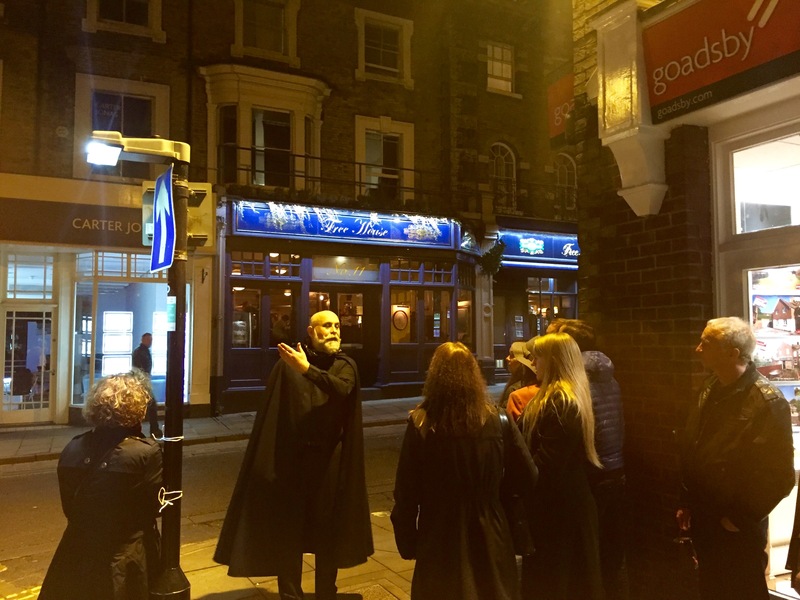 This veiled warning against drinking to excess was one of the stops tonight on our “Spirits of Winchester” Halloween walking tour, which was led by Gary and Marcus of the Cabinet Rooms. 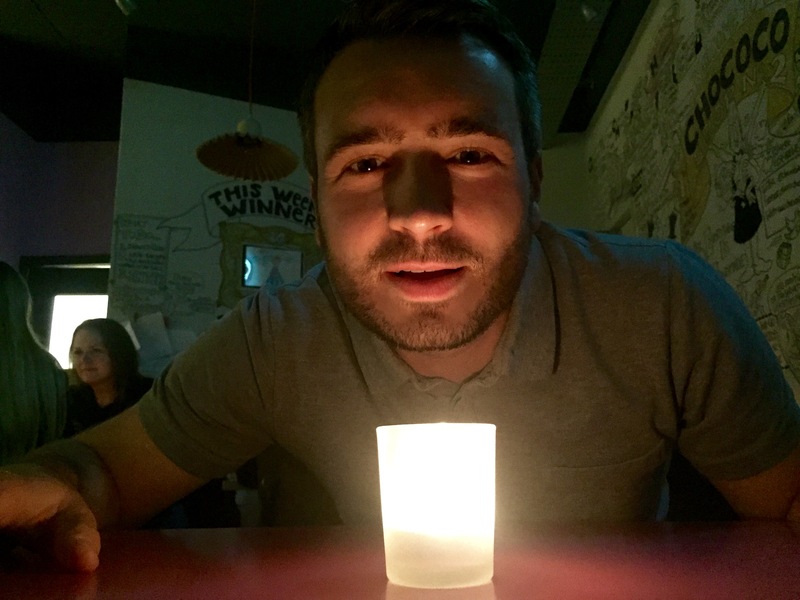 Now it wasn’t just Marcus’s ghostly yarns that were scaring me – I was also petrified that the pint of ale I downed straight after I got off the train was going to give me a deadly fever. Luckily, my chances of death by beer were diminished tonight because it was rum taking centre stage this evening, along with the tales lurking in the shadows around the city. 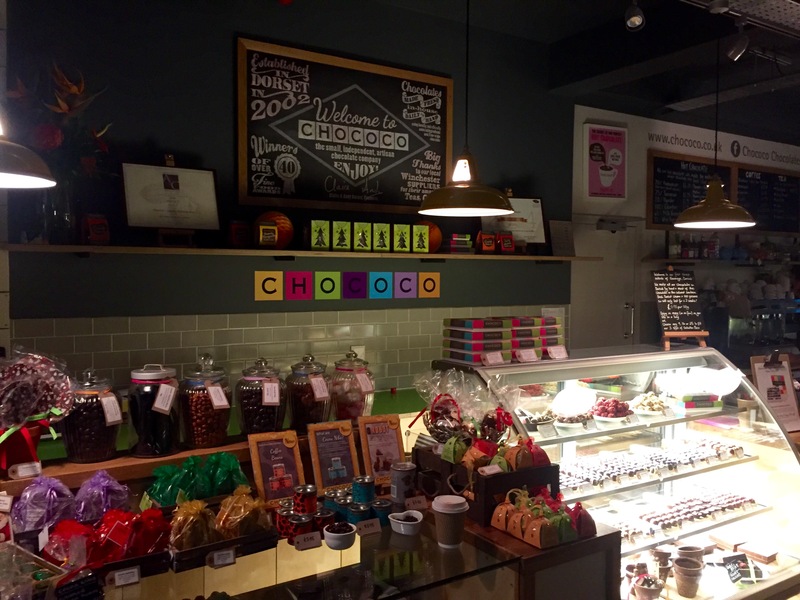 We kicked things off at Chococo with a deliciously rich hot chocolate fortified with rum. Here, death by chocolate was on the cards, especially when Gary passed round the Twisted Nose choccies – heavenly spheres of Dorset cream mixed with Twisted Nose Gin and Alresford watercress. We then set off on our walking tour. Marcus provided the haunting commentary as we visited various eerie locations in the city, his black cape fluttering in the devilish breeze. 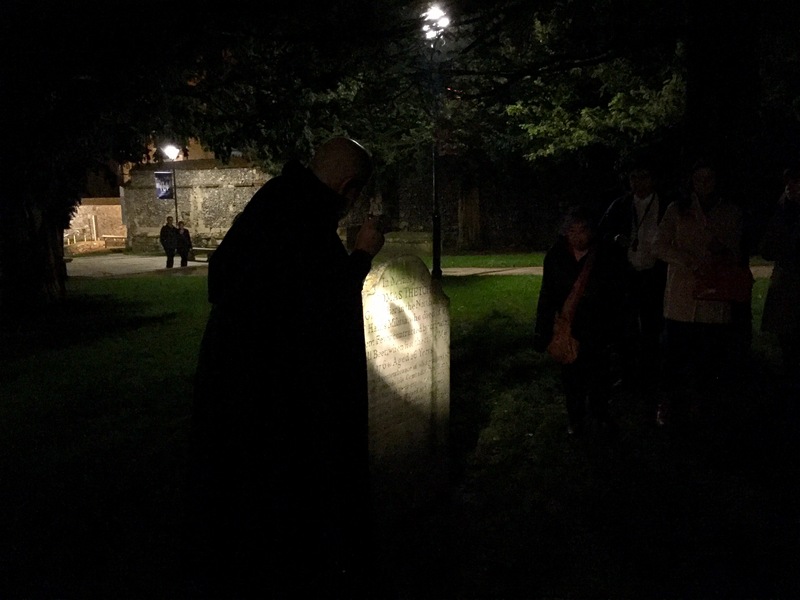 We began at the bottom of town at the Abbey Passage by the Guildhall and had a look around Cathedral Close where we encountered Thetcher’s final resting place under the inky shadows of a large yew tree. We then headed up through the city stopping off at every spot that had a Halloween-themed story lurking in its history. These included the city’s former jailhouse, the Theatre Royal and a pub that claims to be the oldest in England. At one point, Marcus regaled us with some of the stories of unexplained incidents in the ancient cellar of “God Begot House”, a building which dates from 1050. 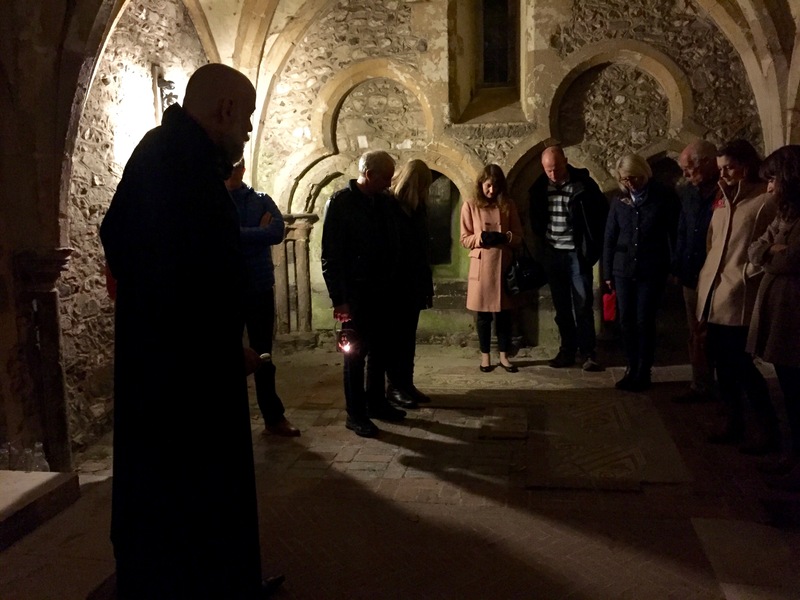 He also explained that the bell that rings for five minutes every evening at 8pm is Winchester’s curfew bell – the signal in medieval times for the townspeople to extinguish their fires for the night. Not that there were many chimneys smoking tonight because it was mild for the time of year. We learned too about the last days of the life of Dame Alice Lisle, who was beheaded outside the Eclipse Inn in 1685. Her crime was hiding soldiers who were attempting to overthrow the king. It could have been worse for the dame – the judge first ordered that she be burned at the stake. Nevertheless, her ghost is said to haunt the first floor rooms of the Eclipse, where she spent her last night. Our walking tour concluded at the Green Man pub on Southgate Street, a few minutes after the 8pm curfew bell had finished echoing through the city. When we arrived, Gary led us down a narrow stairway to the low-ceilinged cellar for some more stories about the ghosts that haunt this hostelry. 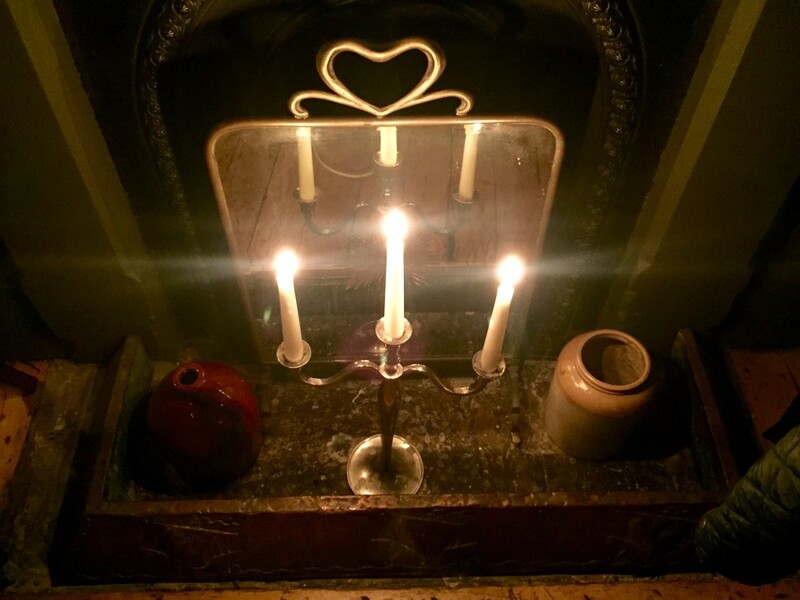 The cellar, dark except for some candles offering small oases of welcome light, was deadly quiet – a little too quiet considering the hubbub on the floors above. Who was the veiled woman stood motionless in the doorway on the way down?! Once Gary had told some tales about his strange experiences in the cellar during his shifts at the pub, we retired to the upper floors to finish off the evening. Unsurprisingly, no one wanted to be the last one up the cellar steps. 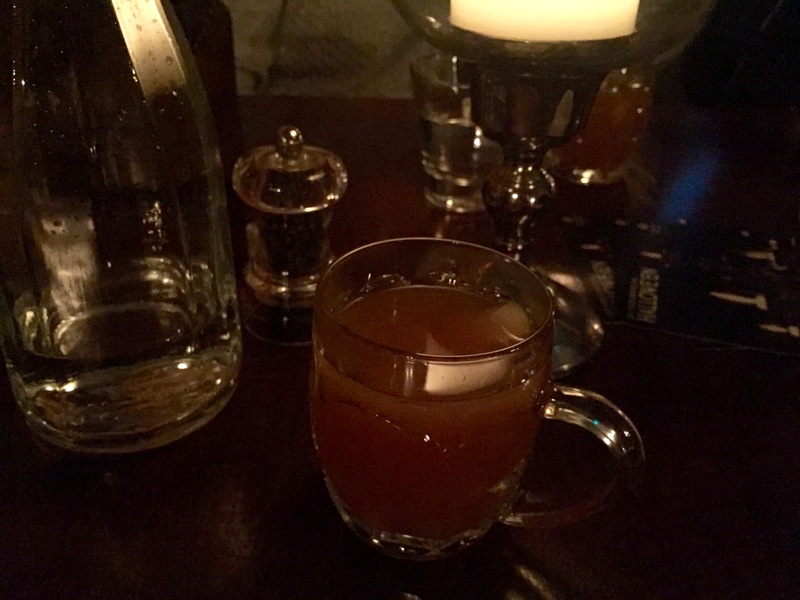 As we settled ourselves in one of the pub’s impressive dining rooms, we each steadied our nerves with a warm cocktail made with rum, cloudy apple juice, ginger and poached pear. A few of us were soon requesting the recipe, so nice it was. 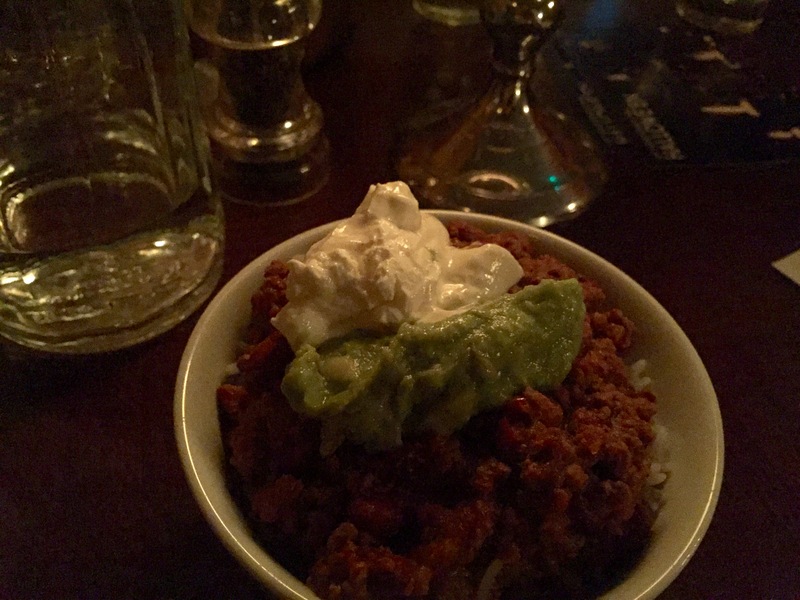 We then enjoyed a bowl of rich beef chilli with fluffy rice, freshly made guacamole and sour cream. If the haunting stories we’d heard earlier had affected anyone’s appetites, it wasn’t showing – the room went ghostly silent as we all tucked in. The guacamole was particularly delicious – refreshing and tangy. A tasty bread was available too. Eager for more spectral tales, we then listened intently as Gary told us more stories about the strange goings on at this pub including how staff often hear the sound of chains clanging in the corridors. If these walls could talk, they’d probably be too petrified to make any sense. 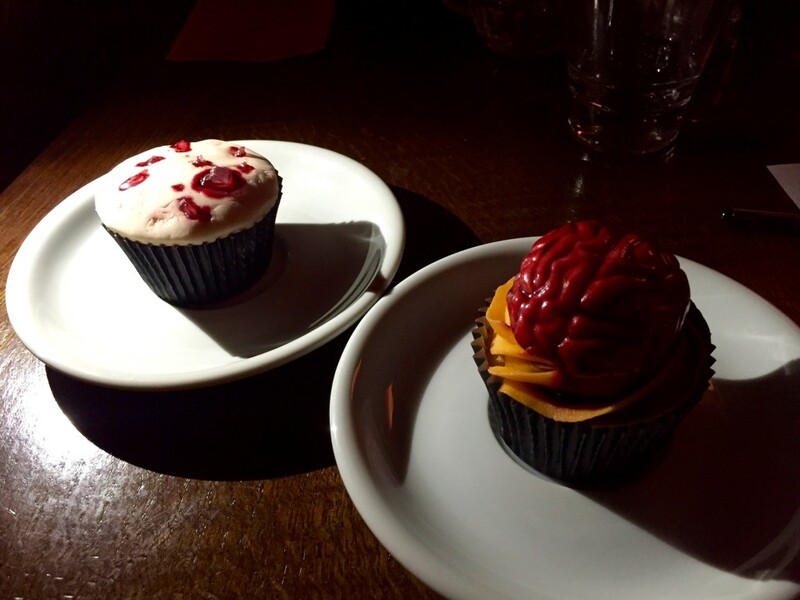 Meanwhile, we had a choice of cupcakes for dessert – “glass wound” or “bloody brain”. I chose the the brain. By now, having been fed, watered and entertained so brilliantly by Gary and Marcus throughout the evening, I’d suppressed my earlier concerns about drinking beer. So I promptly ordered a pint of Betty Stogs to complete the most fun Halloween evening I’d had in years. Info: There are various Cabinet Rooms events throughout the year throughout the year. 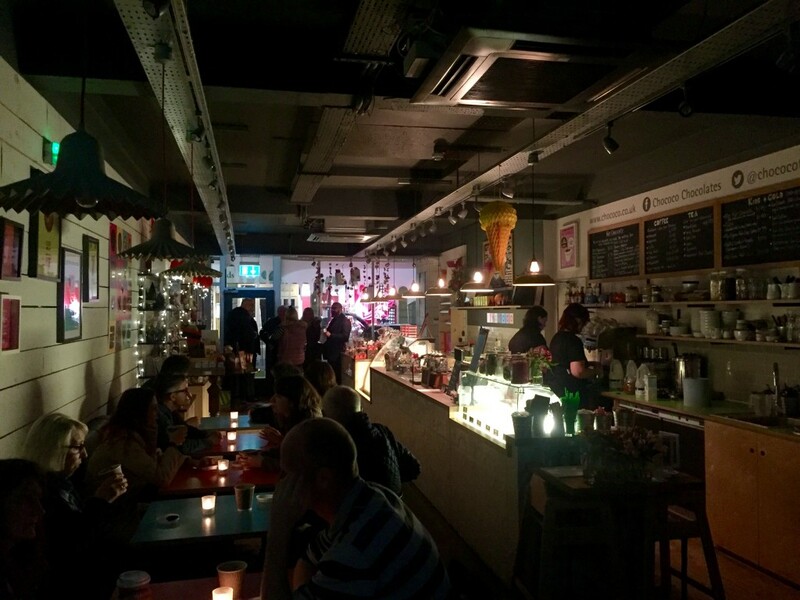 The next event is “Return to Ginchester” on Saturday 14 November, which includes gin tasting, insights into the craft gin movement, a look at the history of the much-loved gin and tonic, and more. Gary and Marcus are also involved in Winchester Cocktail Week, which is coming to the city for the first time in February next year. Disclaimer: The Cabinet Rooms didn’t charge me for my ticket to this event.